Through the centuries, stories of popes and of the papacy from Catholic and non-Catholic perspectives, presented as biographies or as histories of an institution have boomed with the power of this often controversial office. Whether as liberating truth which comes forth from the Church or as narrow perspective; whether as Rock of the Church" or "stumbling-block," primacy remains a reality at the heart of many ecclesiastical problems. Until now, a complete history of the primacy has been missing. Papal Primacy fills the void by providing a clear understanding of its history. 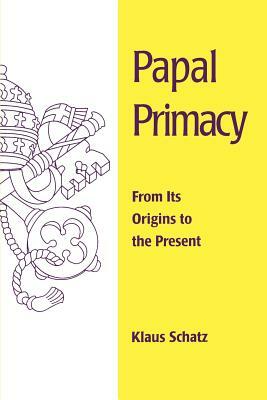 In this, the first complete history of the papal primacy, Schatz traces the development of the idea of a papacy as center of teaching and jurisdiction from its earliest Roman beginnings, through centuries of development, the great papal schism and the struggles over conciliarism and Galicanism, to the triumph of papal authority at Vatican I and beyond that to Vatican II and the growing realization that there are no "once and for al answers" to the Church's questions. Papal primacy has grown with the Church, and it remains a reality embedded in the Church as a living community open to change. Chapters focus on the development of the primacy in the first five centuries, different functions of unity in the East and the West; the papacy as the head of the Church and Christendom in the Middle Ages, and the primacy as confessional mark of identity in modern times. An appendix includes the following texts: Irenaeus of Lyons, Adversus haereses; The Canons of Sardica 3, 4, 5 (343); Gregory VII, Dictatus papae (1075); The Council of Constance, Decree Haec sancta (April 6, 1415); The Council of Florence, Formula of Primacy; The Four Galican Articles, Declaration of the Church of France (March 2,1682); Papal Primacy of Jurisdiction and Papal Infallibility According to Vatican I (1870); and Episcopal Collegiality and Papal Infallibility According to Vatican II (Lumen gentium 22).